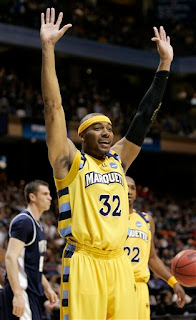 Marquette Moves On To Face Missouri ~ The Bucky Channel - The World of Sports from Wisconsin's Perspective. Honestly, I thought Marquette was going to lose against Utah State, and in the five different brackets I filled out, I picked Marquette to win zero times. I just figured it would be another typical game for them with James out - they'd play close but then lose it at the end. Thankfully, even though this was another game that went down to the wire, it was Marquette that was able to pull it out and get the 58-57 win. I provide more analysis in my live blog of the last 3:39 minutes, even though I was the only one to attend. With the victory, Marquette moves on to the second round of the NCAA's where they will face Missouri. Missouri is the #3 seed, and they moved on after beating the Nard-dog's alma mater of Cornell. The time is yet to be announced. I don't think too many people picked them to make the sweet 16, but Dickie V is already predicting a Marquette victory over Missouri, so I guess you never know. Where is your Badger basketball post? I thought this was the "Bucky Channel"? Very disappointed. You just lost a reader.